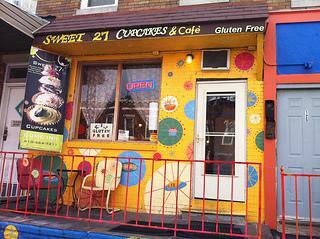 Sweet 27 is a gluten free bakery and cafe that offers large portions with a cozy atmosphere. Upon entering Sweet 27, the large arrangement of cupcakes is the first thing to catch your eye. Before dessert, however, the cafe offers a diverse breakfast, lunch, and dinner menu, drawing inspiration from different regions of the country and the world - who would've thought Chicken Weinerschnitzel would share a menu with Chana Masala, and Plantains? The entire menu (desserts included) is gluten-free. Additionally, the cafe offers a selection of vegetarian and vegan fare, as well as food that is casein and dairy free; there is literally something for everyone. The tiny cafe gets pretty busy around mealtimes, but has a great ambiance, and an eclectic mix of patrons. Check the bulletin boards posted on the walls for information on local Baltimore events!